While a great deal of press has been given to The 55 Essentials, I would encourage you that unless you are that particular teacher of the year, much fewer will probably be sufficient. When trying to write rules, several teachers I know have tried to cover every aspect of student behavior. They think of all their own personal pet peeves and the things that students traditionally do wrong, compiling them into one monstrous list. There is one major problem with this: Students are varied and seemingly eternally creative. It was the year of the Winter Olympics, so many of my junior high students were watching the events. As I was enthralling my class with tales from history, I looked over, and what to my wondering eyes did appear, but one of my students in his seat with his knees under his chin, calculatingly moving from side to side. “What are you doing, Nate?” I inquired. “I’m bobsledding.” He replied, most innocently. Like never before, the pressure on teachers is ever increasing. With PL221, No Child Left Behind, Standardized Testing scores, and a myriad of other “indicators,” you will increasingly feel like there are never enough hours in the day. While it is possible to work eighteen hours a day on teaching—I have done it—it is not, in fact, healthy. It took me ten years of teaching to realize that there were limits on my physical body, and that it is not wise to push those. So listen up! This is important. Are you listening? You have permission to go to sleep—even if you haven’t finished all of your grading. I know, I know. It just means that much more for you to do tomorrow. I understand, and I’ve been there. I was one of those non-worksheet English teachers with plenty of essays and many hours logged in at the Barnes and Noble café, which incidentally is a great place to grade. My goal is always to hand things back the next day, usually because I know I will be getting more things to grade that night. But, somewhere along the line, I realized that my students would much rather wait a day or even a week to get a paper back and have a pleasant, well-rested teacher, than get papers back immediately from a teacher who was up to all hours of the night grading and now has no patience. Let’s face it, most of us are grouchy when we operate on little to no sleep. Now that I teach history, I explain to my students that at 1 minute a page, with 180 students, that is 3 hours of my life. The average test takes at least 10 minutes to grade, so that’s 30 hours outside of school. I now tell my students (and their parents) if they get tests back before two weeks, to consider that a blessing. When I explain the timing, they understand. In addition to grading, you also can’t possibly teach everything your state expects you to. If your state is anything like Indiana, your state standards were written by people who have either never been in a classroom, or certainly didn’t work with the kind of kids I see every day. If they did, there is no way they would expect what they do. So, knowing that, my advice is this: Prioritize! Look at the skills covered on your state tests. Make sure you cover these. Once you’ve done that, critically examine your subject matter. What are the skills they will need in the next grade to be successful? If possible, talk to the teacher they will have the following year. Ask him or her for their “dream list” of skills they would like their incoming students to possess. Cover those. Then, what will help them in life, even if they never take a course like yours again? Look for opportunities to teach life lessons, and you will find tons. Be honest. How much do you really remember from high school? What you remember is the impact of the person and the WAY to study, not the material itself. My 11th grade history teacher Mr. Jackson gave me the powerful advice that students remember the things with which they emotionally connect (usually the teacher, not the subject). Finally, teach what you’re passionate about. Remember what you loved about your subject. It really is your passion which ignites a student’s imagination. As Danny Silk says, “I’m going to have fun because there’s nothing worse than me being bored while you watch.” If you love your material, they will pay attention. I didn’t like Science and it wasn’t easy for me, but I loved Chemistry and Physics because Mr. Minor was so passionate about it. His excitement made it impossible for me to not care. Your passion will encourage them to care. So remember what you love, and care for yourself so it’s still enjoyable! Lie #2: If students don’t respect you, you’re doing something wrong. This one took me a long time to debunk. If you are an insecure person, and let’s face it, most of us are when we begin teaching, the first time a person is disrespectful of your authority, it will throw you for a loop. Having my head packed full of exciting lessons and textbook examples of classroom management, I was stunned the first time someone was disrespectful of me. I internalized it. In my mind, if I was worthy of respect, they would respect me, so if they didn’t, it must be something I did. I spent months, running into years, before I realized that kids are naturally disrespectful, and as I said previously, you have to earn their respect. Finally, I was able to stop beating myself up and truly take the authority that was rightfully mine. I realized that I didn’t have to tolerate disrespect, and even beyond that, I didn’t deserve disrespect. Now, let me take a moment to stress again: Respect is earned. It doesn’t come naturally. The weakest form of respect is positional. So, how do you earn respect? Honesty and Consistency. First of all, let’s consider honesty. Let your students be a part of your life. Tell them when you’re happy, sad, sick, going on vacation, having dinner with a friend, or attending a family birthday. One of the greatest times I have had as a teacher was the time surrounding the death of my dad about two months ago (as of writing–Father’s Day: June 15, 2008). It was completely unexpected and happened in the middle of summer school when I was teaching the students I would have the upcoming fall. It was difficult for me, as I had only known them a week before my dad died, but when I returned to school, I made myself share with them, both who my dad was, my pain in losing him, and my pain in knowing that most of them didn’t have a dad like mine. It broke down amazing walls with them, and they were more sensitive than I could have imagined. I’ve met teachers that are so closed about their lives, they don’t want students knowing anything about them. This hardly engenders respect. Let them see you as a real person, and they will respect you. Obviously, there are lines with what you share, but in my opinion, an honest question deserves an honest answer, and boy, will they ask. Secondly, Consistency is vital. First, let me release you: You will never be 100% consistent. You are, in fact, human, and as such, are prone to miss things, have bad days, or forget what you just told the previous student who asked. That being said, justice and fairness is something that students long for, and they look to you to establish it. Have a few basic rules that students know for a fact will be enforced every time. Apologize when you are out of line, or for those times when you have been inconsistent. A great book on this subject is Tools for Teaching by Fred Jones. He is an amazing instructor with a lot of insight, especially in the areas of establishing boundaries and being consistent. Example as of posting: On the last week of our 2016-2017 school year, a teacher I know lost her long-term boyfriend. She is one who believes your personal life is not the kids’ business, so consequently shares very little about herself (to the point where she had told students she didn’t have a boyfriend despite their almost decade relationship.) Then, when he died suddenly (as a man around 30), she was understandingly devastated. I’m so grateful she chose to share her experience with the students. Suddenly, kids who couldn’t stand her were crying with her–they saw her as a real person. Those who had always liked her gave her hugs, words of encouragement, and added their tears to hers. Yes, a few were still jerks, but for the most part, they were incredibly sensitive. While I understand that personality may play a large role in this, I still tend to believe honest questions deserve honest answers, and being authentic is a great gift. If you’re like me, this is the first piece of advice you received as a new teacher. Someone gave you a lecture about not being too friendly with kids and “professional distance” and the way you have to establish your authority early on. On this statement, I have one word to say: Hogwash. This method may have worked in the time when children were “seen but not heard,” but the fact is, if you truly want to reach this generation, you have but one requirement: Be real. Kids today can spot a fake faster than anything. The more you yell and bluster, the more they will tune you out, or better yet, enjoy the fun of watching you throw a tantrum. I have heard students say that they purposely annoy certain teachers because, “It’s funny because he/she turns red and cries.” It certainly is not the way to win respect. “Death is not the enemy, gentlemen. If we’re gonna fight a disease, let’s fight one of the most terrible diseases of all–indifference. Now, I’ve sat in your schools and heard people lecture on transference…and professional distance. Transference is inevitable, sir. Every human being has an impact on another. Why don’t we want that in a [Student/teacher] relationship? That’s why I’ve listened to your teachings, and I believe they’re wrong. A [teachers]’s mission should be not just to prevent [ignorance]…but also to improve the quality of life. That’s why you [teach a subject], you win, you lose. You [teach] a person, I guarantee you, you win, no matter what the outcome.” (Movie transcript). So, let your students be close to you. Enjoy them as people; let them touch your heart. As you truly care about your students, they will respond. I heard a conference speaker share that their standardized test scores had been raised dramatically when they divided the student population and assigned each student to a teacher who merely took an interest in how the child was doing. So SMILE! It makes a difference! When I set out to write this book, I’ll admit it was with fear and trepidation. You see, like many good teachers, I felt I was young and inexperienced with nothing much to offer. Sure, I was creative, and my students enjoyed my class, but that wasn’t any special gift, was it? Then, two years in a row, I was asked to mentor women older than myself, who, to me, seemed to have it all together, and whose advice I should be asking, not vice versa. But, through those times of mentoring, I began to see that there was indeed wisdom I had learned that I had to offer. And so was born the decision to share it with you. Much of what you will read over the next pages is just a compendium of the wisdom others have shared with me (kudos, Mr. Sundberg), seasoned with many mistakes of my own. I trust through this, that not only will you learn new strategies, but that also, you will be reminded of the reason you began teaching in the first place. (No, I’m not talking about the money or summer vacation, which frankly seems not to exist.) I hope to break through the lies you’ve been taught and set you free to be the teacher that you have been afraid to be. This book is yours. Take it; steal the ideas. Use what you can and throw away the rest. (Or as Mr. Norvell used to say, “Eat the chicken and throw away the bones.”) But most of all, be affirmed that you are making a difference every day, and that the role you play in the lives of your students is invaluable. I started this blog almost seven years ago when I was in the process of writing a book entitled Life Lines for Teachers–a collection of advice pieces I wish I’d known as a beginning teacher. I was new to blogging, but had been shamed into believing everyone who wants to be an author needs a blog. So, I wrote–sometimes previewing sections of the book, sometimes dealing with incidents that arose in the the course of the school year. Then, the state made cuts. By changing the complexity model to only funding based on free lunch, not free and reduced lunch, our school (80% free and reduced lunch) lost almost 20% of our budget. Overnight, my building laid off 1/4 of its staff, and I went from teaching all of the eighth grade (a task in and of itself), to teaching all of eighth grade and half of seventh grade–all while writing the plans I was teaching, creating power points, etc. (an insurmountable task). Obviously, the blog got pushed to the wayside–as did the book. I had gotten a rejection letter from Scholastic, and while I had plans to finish it anyway and submit to other publishers, again, time was an issue. Obviously, I will have even less time next year than I did this, but I realized in the course of travelling (and blogging) for another grant I received, that I have an unpublished book sitting and not helping anyone. So, while I may not have time to blog regularly. I should have time to post chapters from my book–and maybe occasionally add something if the stars align. So, thank you to those who have stuck with this blog or checked in–even during my long absence. I hope what I post will be helpful! Today (5/2/15) marks the end of an era. 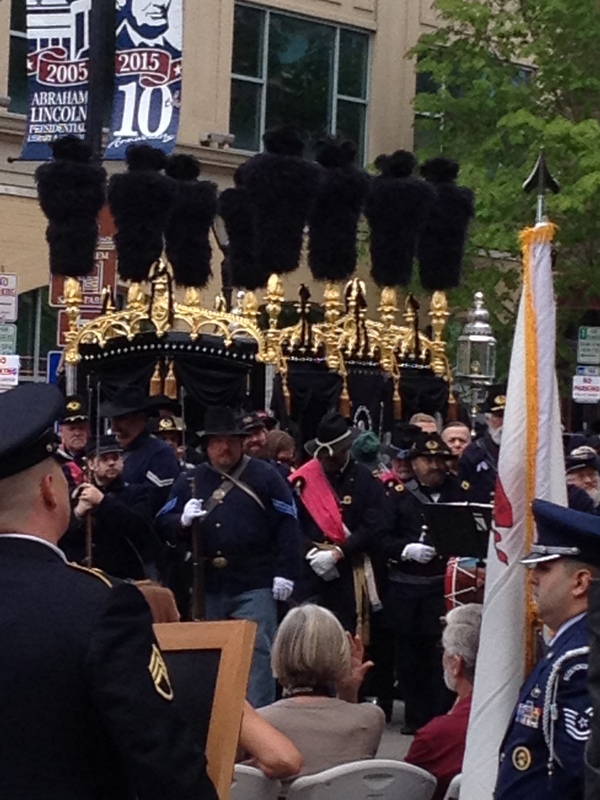 While there were Civil War related happenings that occurred after today, the celebration of Lincoln’s funeral trail arriving in Springfield, Illinois, represents the end of a glorious 4 years of remembrance. As a reenactor, I have thoroughly enjoyed having the Civil War so close to our thoughts during this time. I’ve attended national events, visited battlefields and museums, and watched movies (including this week covering the Lincoln assassination and showing The Conspirator) and TV shows focused on the period, and attended countless other events. With today’s event, that aspect will begin to fade. For that reason, despite the busyness of the season for me and the struggles of coming off chemo and preparing for surgery for my friend, we decided to make the 3+ hour trip to Springfield–to be there for this once in a lifetime event. 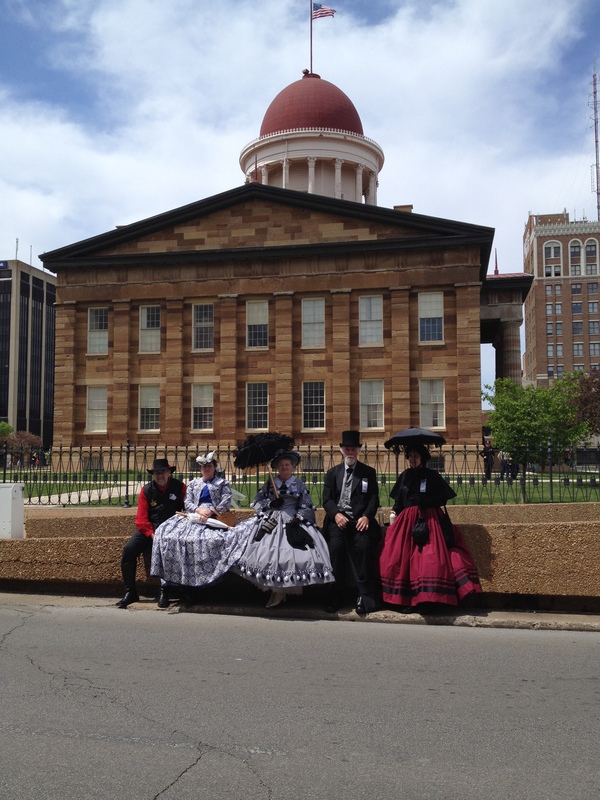 We arrived in Springfield just as the horses were pulling the hearse down the street followed by a procession of reenactors. But, we still had to park, so we actually arrived just as the formal program was beginning. It was truly a beautiful beginning. Bishop Thomas Paprocki of the Catholic Diocese of Springfield opened with prayer, recognizing the fact that when Lincoln left Springfield to travel to Washington D.C., not knowing if he would see his friends and neighbors again, he left them in the care of God. He explained that while many lost a president, residents here lost a friend. A number of other speakers followed–each with a pearl of wisdom. Governor Bruce Rauner shared about Lincoln’s role as a uniter of races–a relevant topic in light of recent events. From the opening program, we headed over to the Abraham Lincoln Presidential Library and Museum. It was an amazing experience, well worth the $15.00 combined ticket with Union Station (which I got for $8.00–Teacher perk…) The museum really focuses on Lincoln’s entire life. 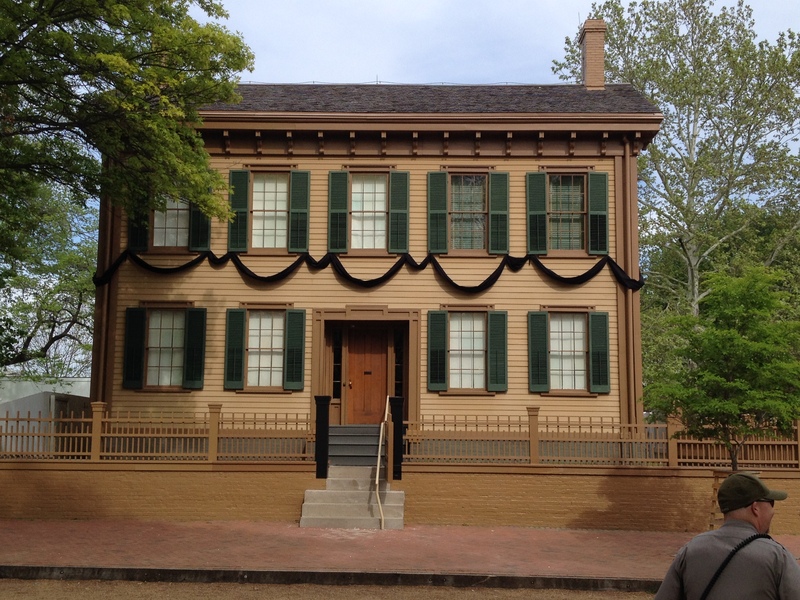 It starts with Journey 1, where visitors will track through Lincoln’s early life, his boyhood, jobs, courting, etc. In the section called Journey 2, Lincoln’s political life comes to life and death, for here we trace Lincoln’s career as a young Senator, through his presidency, and finally to his funeral. 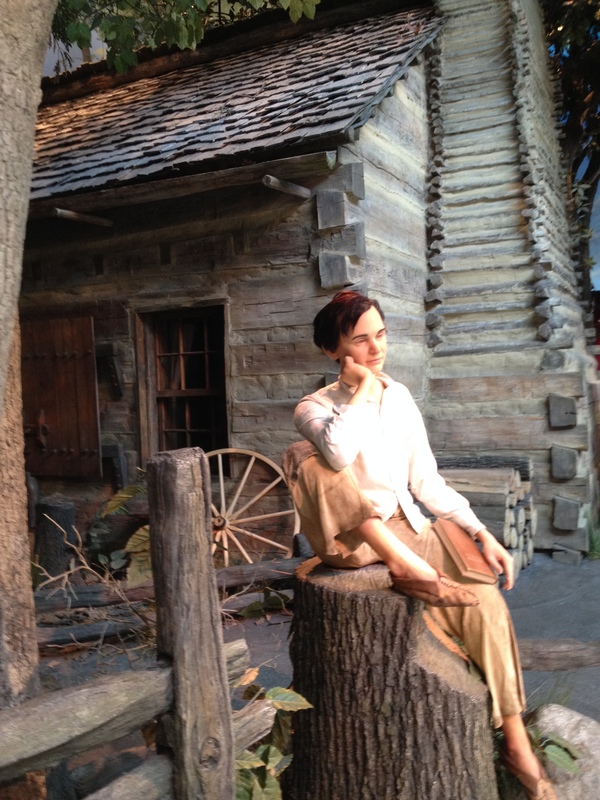 Each area offers incredibly lifelike wax figures portraying scenes in Lincoln’s life, but also shows artifacts from the period and gives information on Lincoln’s journey during that time. My favorite section of the display was a series of political cartoons published about Lincoln. I had seen about 4 or 5 of them, but there were probably 50 completely vilifying Lincoln. I’ve long told students that political cartoons back in the day were brutal, and the ones about Lincoln are exceptionally cruel. Just another opportunity to see a different side of Lincoln. The dual ticket from the Museum also offered entrance to Union Station where there is currently a display called “From History to Hollywood.” This display boasts sets and costumes from the movie Lincoln. What was most interesting to me in this section was the wardrobe of Mary Todd Lincoln (costumes.) I learned that Sally Fields is exactly the height of Mary Todd, though she had to gain 20 pounds to play the role. Standing on the floor beside the costume resting on the steps, I towered over the top (I’m 5’9″). How short was Mary Todd?! About 5 feet tall–Imagine that next to the 6’4″ Lincoln. They must have looked fun in pictures, though I don’t recall any of the two of them beside each other. With sore feet, we headed to the Lincoln House, but, when we found out that the next tour wouldn’t leave until about an hour and a half later, we decided to just enjoy the outside and head out of town. 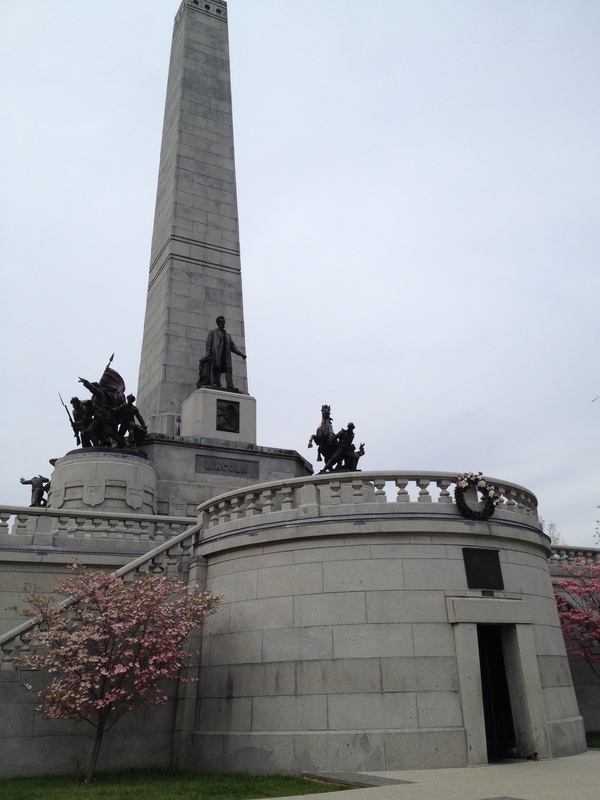 We made one final stop at Lincoln’s tomb to see where all of the family is buried, except Robert, who is buried at Arlington–I’ll have to look him up next time I’m there. The monument tomb has to be the coolest burial place. Not only is the monument huge and imposing, there are replicas of numerous statues of Lincoln with details of where the actual statue stands. The walls also bear transcripts of famous speeches Lincoln made–incredible to read. Finally, the sarcophagus for Lincoln is beautiful and surrounded by the flags of states where he or his ancestors had lived. Just an amazing and appropriate place–and indeed, the perfect place to lay to rest this season of Civil War celebrations. What stood out to me was the fact that he had a tougher task than George Washington. Washington merely had the task of building a nation (merely! 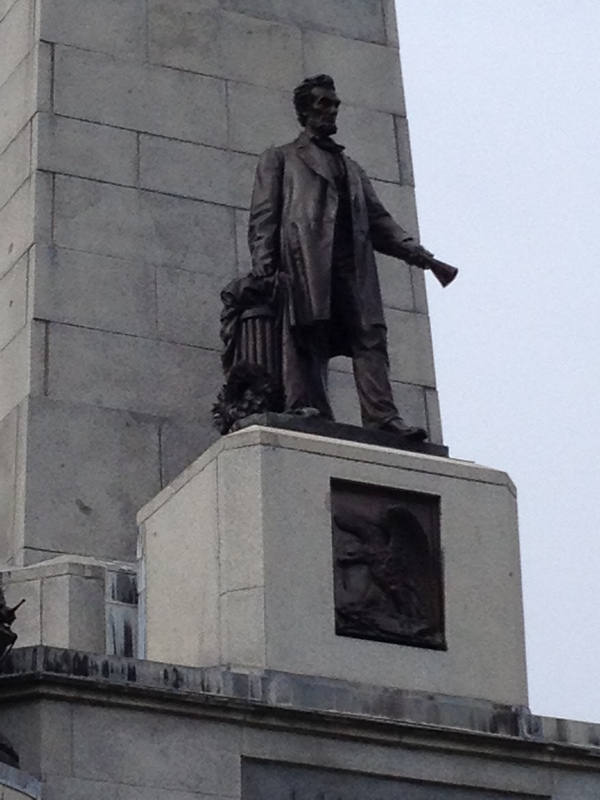 )–Lincoln had the task of reconciling a nation that had splintered before he ever stepped into office. And yet, he managed. With faith and trust in God, he saw our nation weather devastating losses, brought an oppressed people to freedom, and kept our nation from splintering, all while undergoing untold personal losses–the death of three of his children and its affect on both him and his wife. One of my students asked me this week how the nation would have been different if Lincoln had never been assassinated. The ripples, I explained, would be vast. With easier reconstruction, racial reconciliation might have been easier, perhaps even eliminating the need for the Civil Rights movement, as segregation might never have happened. But, he also might not have been quite so loved. Lincoln had been horribly unpopular in wide circles, but with his assassination, the tide turned, and people flocked to pay their respects. But, regardless of what might have changed, the fact is, 150 years later, we are still touched by the legacy of a man who held fast in difficult times and saw our nation through. His example of steadfastness in the midst of adversity is incredible. May we strive to do the same today–to bring reconciliation to long held wounds, to hold fast to truth and integrity, and to seek to leave a legacy for those who follow behind us!